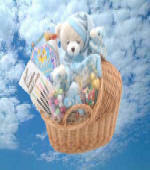 Teddy bear with blankie, baby slippers, baby fortune cookie box, reception sticks candy box, choc. booties, assorted Jelly Bellies Dutch mints, blue/pink. choc. cigars and yellow choc. ducky. 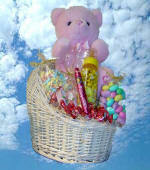 Teddy bear with blankie, baby slippers, baby fortune cookie box, reception sticks candy box, choc. booties, assorted Jelly Bellies, Dutch mints, blue/pink choc. cigars and yellow choc ducky. 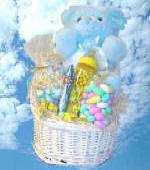 Teddy bear, candy pacifier assorted Jordan almonds, large baby bottle with Jelly Bellies, blue/pink choc. cigarettes, choc. baby booties, Go lightly hard candies. 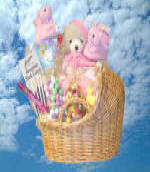 The crib contains: Teddy bear, candy pacifier, assorted Jordan almonds, large baby bottle with Jelly Bellies, blue/pink choc. cigarettes choc. baby booties, Go Lightly hard candies.